The The Talent Code identifies three areas of focus if we are to succeed and certainly, these are all important, but it all starts with finding a master coach. Let's look at some of the issues involved when looking for the best coaching for young racers. Here we'll take a look at the first one, finding a master coach and by that we mean a longer-term coach, not just finding a good coach for a camp or a short training session, but looking for a great long-term coach. A good starting point would be to go read that book, so you have the context - below we're looking at this only from the perspective of ski racing. As a parent, you may not have other options but the local hill's race club, with whatever quality of instruction they provide. Race training will create better skiers anyways, so if you're in it for the fun, that's as good as any. If you're looking for performance and you have options, then you have to dig a little deeper. Bigger clubs and academies with established programs will generally be able to afford and entice better coaches: look for their results in the local leagues over the past few years. Don't dismiss smaller hills and clubs either: some of the best skiers came from places like "Buck Hill" (vertical drop 310 ft) - the quality of coaching at the smaller ages is a lot more important than the facilities and the hill. If you were leading a club, what would you do? Would you allocate the most experienced coaches to the older age groups? Studies show that quality coaching is very important at the earlier, formative ages. So pay attention to that - many many clubs tend to put their most inexperienced coaches at the lower age groups. At the lower age groups, U8-U10, FUN is the keyword. The little ones must be affectively engaged and training should revolve around "games". They should ski varied terrain and learn general skiing skills rather than race skills, even though they spend some time in a race course - this time should be limited. Spending time in the park and man-made terrain and challenging them with environments is great to work on basic skiing skills. In the east, where the varied terrain is at a premium, the little ones tend to do better when spending more time in a course. These courses, however, should not be just plain race courses, but training environments, presenting them with all sorts of challenges (impossible flushes, ski cross, jumps, gate combinations etc). Look for a coach that will keep the athletes skiing, engaged, challenged while having FUN all day, while focusing on developing great fundamentals1. At U12-14 the racers start to mature, both physically and psychologically. They need attention from both those points of view. U12 is a time for focusing mostly on technique and some tactics and U14 on both, so somewhat more time in a course. Training as a group of too wide a range of skills is the most damaging here. An ideal club would have groups or sub-groups per skill level. By the time they finish U14, around 13-14 years of age, the young racers must master very good fundamental technique - otherwise, their development will be limited. This is a critical age - at U14/U16 is where many athletes leave the sport of ski racing and some of that comes down to bad coaching. is the coach talking all the time, doing drill after drill, with little feedback? Move on! is the coach showing, demonstrating, giving brief directions, some feedback? Good! see Decision training vs behavior training in alpine skiing. is the coach giving each athlete individual attention every now and then? Good! is the coach just running them through the same course all day, too little variation? Find another! does the coach praise the effort or the outcome ? Stick with the one that praises the effort! do the athletes look challenged and engaged, or is the task/course too difficult and only 1-2 shine while the rest struggle? Or is it too easy, they all look bored? At U16 and up, more tactics and race training is the norm, as athletes start to grow into FIS racing or stay with local league racing. Lots of travel is the norm. Since you're the one person that cares the most about your child's training, it is not a bad idea to become a race coach, especially if they're still young and you can grow with them. This is how many of us got started. Some of the biggest names in ski racing started (and some are still) coached by their parents... Ianica and Ivica Kostelic, Marcel Hirscher, Mikaela Shiffrin just to name a few. Even if you've never been involved with ski racing, the training is guaranteed to improve your own skiing and you'll get to spend a lot of quality time with the kids. As the kids evolve quickly, it will become demanding to keep up in knowledge and experience, but that's what we're here for. The main objective when we started this website was to help parents like ourselves, like yourself. A lot of the racing level is written from the perspective of how to coach someone. 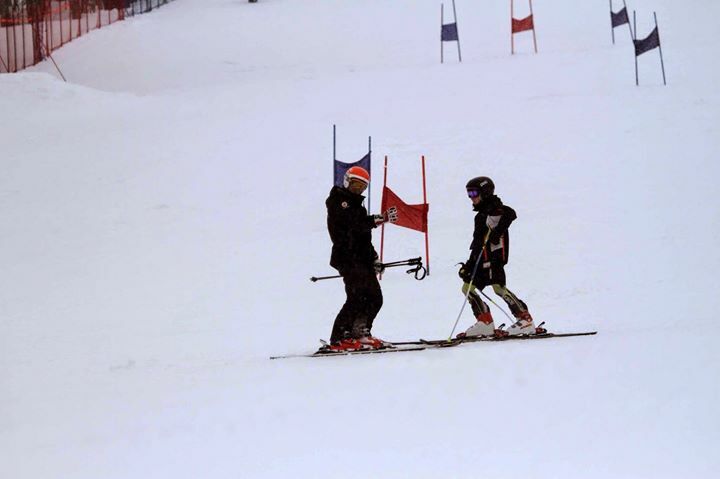 I myself started when my children were U10, without any previous racing or coaching experience, advancing to level 3, to keep up with the demands of coaching competency in both technical and tactical areas at the higher levels, FIS. As a master's racer or a new parent coach, you should get any masters training you can get and the quality of coaching will vary, but generally, you'll meet good coaches. Because you change coaches often and they have larger groups, you may get less directed feedback and even less on technique. It's a good idea to befriend others in your group, some that are obviously more experienced and better skiers and ski with them more. Many ski clubs organize internal masters race training - ask around: you may be able to join them. Another option is race camps. There are many race camps all year round and all over the world, with good coaching. Attending these is a good idea, although it tends to be more expensive than local options, of course. While consistency is great, it is good also to attend different training opportunities and work with multiple coaches every now and then and benefit from different perspectives and focuses, cues etc. Ski instruction and even race coaching is not very well standardized across the world or even within the same club, from coach to coach. 1 Note that not everything that goes for "fundamentals" out there are true... "fundamental" or good to focus on. Some are more detrimental to long-term performance than others! Often, you'll see coaching focused on detrimental aspects or teaching them in a sub-optimal sequence, i.e. start focusing on the upper body first or such. Read the next topic for more ideas, Ski race training. Viewed 133 times ( | Print ) this page.